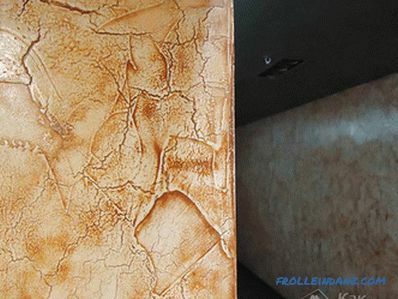 Drywall is a unique building material, it is available in stores and has a reasonable price. If you come to the store and ask if there is drywall, the seller will surely clarify: "Ceiling or wall"? It is safe to say that the use of this material influenced the approach to the search for sources of lighting and now you can see a variety of spotlights for gypsum ceilings on sale. How to choose a suitable light source and what needs to be taken into account will be discussed in this article. Since plasterboard ceilings are quite popular, the variety of fixtures increases every year, and not only their design, but also the source of light changes. Initially, only incandescent lamps were installed in the luminaires, then fluorescent lamps were used, and now LEDs have appeared. The changes affected the form and appearance, but the variety is so large that it makes no sense to describe all the lamps. And when you consider that designers are constantly offering something new, then the senselessness of such a venture becomes obvious. In order to get acquainted with the catalog, just go to the selling site or visit a specialized store and look at the shop window. As you can see, there is something to choose from. Now we will consider how installation of this or that type of lamps is carried out. 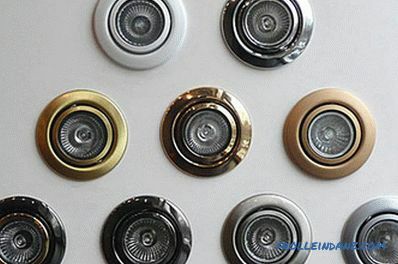 When choosing spotlights, it is important to tune in to a specific order of installation. The first step is to build a frame from the profile. Now you need to plan the number of lamps and their location on the ceiling so that the flush-mounted lamp is not located in the same place where the profile is located. For overhead and pendant lamps such accuracy is not needed. 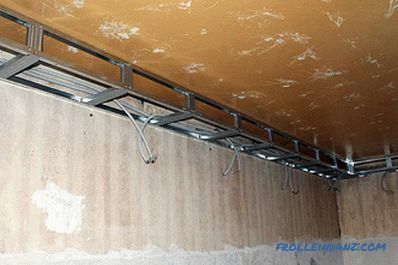 It is necessary to lead the wiring to the luminaire installation sites so that the wire can then be pulled out of the hole so that it is convenient to connect the luminaires. So that later you don’t have to guess where to install the luminaire, it is recommended to make a map showing the location of the luminaires with indication of the distances from the walls. After the installation of drywall in it, it is necessary to make holes for the wire (if the lamp is suspended or laid on) or a built-in lamp. Only after the entire list of works has been completed, lamps are installed. 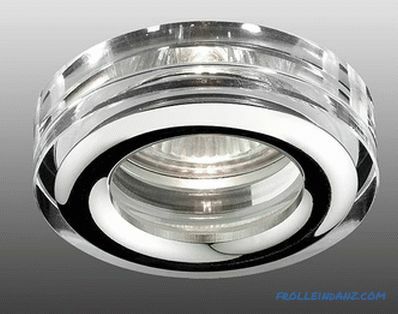 Recessed (flush) spotlights are most common, and many people think that they are the only ones, but they are not. A supply wire is connected to the lighting device. Spring clips are raised to a vertical position, and the lamp is installed in its place. A cartridge is connected to the light bulb. 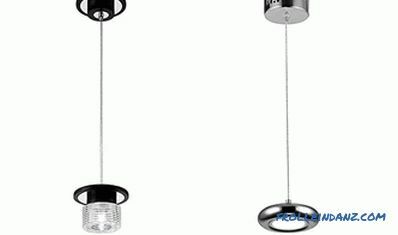 A halogen lamp is installed in the holder and secured with a retaining ring. Depending on the type of luminaire, the method of connecting the cartridge and the installation of the lamp may be different. Before purchasing a mortise luminaire, measure the shortest distance between the suspended ceiling and the main ceiling. If this is not done, the height of the light can be a significant obstacle to installing it in such a place. 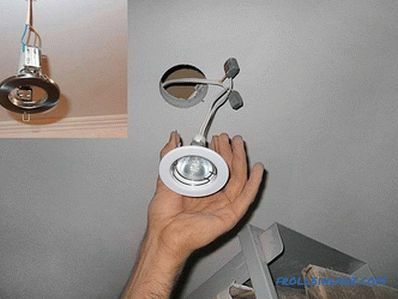 For installation an overhead spotlight does not need to make a large hole in the ceiling - it is enough that you can pull the wire through it. After the wire has been pulled, you need Attach a mounting platform to the ceiling and mark the attachment points. Then the platform is retracted, and plastic anchors are screwed into the marked points (or a dowel-butterfly is installed). Self-tapping screws fix the mounting platform to the ceiling, and the lamp is attached to it with screws. There are overhead spotlights made in the form of a chandelier. The mounting method is identical to that described above. Suspended spotlights are made in the form of a chandelier and are used in rooms with high ceilings. 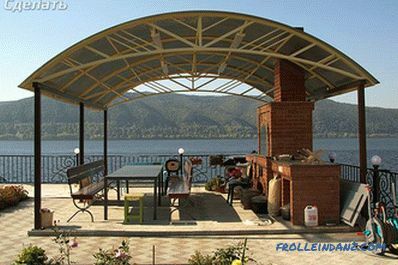 They are fastened in the same way as overheads, with the only difference that the fixture itself is not fixed to the gypsum board ceiling, but the base. B In the past, luminaires for reflector incandescent lamps with an E27 or E14 base, which sizes differed significantly from each other, were popular. 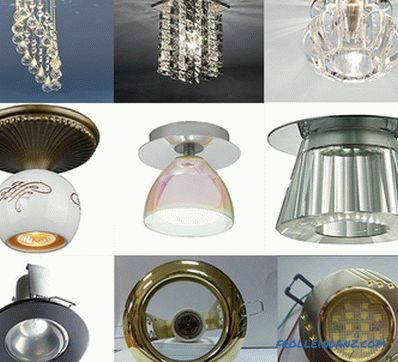 Subsequently, many manufacturers began to produce under these lamps, first fluorescent, and then LED lamps. A significant disadvantage of these lighting devices is their great height and the inability to regulate the direction of the luminous flux. 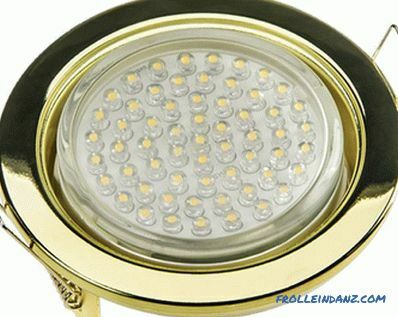 When choosing such a lighting device, you need to decide on the type of lamps that will be screwed into it. 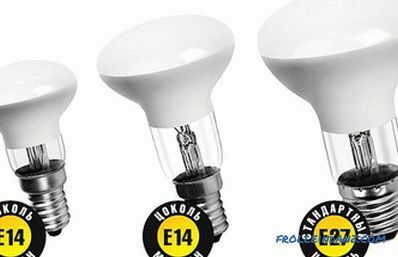 Incandescent bulbs with E14 base - 40 W, E27 - 60 W. There are exceptions, but it’s not easy to find a light bulb with other parameters, so there’s no hope that it will be very light. The original housekeepers also have a small capacity. Such lamps are still used in offices but they do not serve as decoration because of the use of cheaper U-shaped lamps in them. 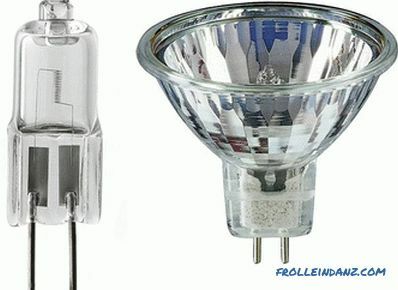 The use of halogen lamps has significantly reduced the size of the lamps. Luminaires with adjustable light direction appeared on the market. Light bulbs are very sensitive to power surges in the 220 V network, so they often burn out. 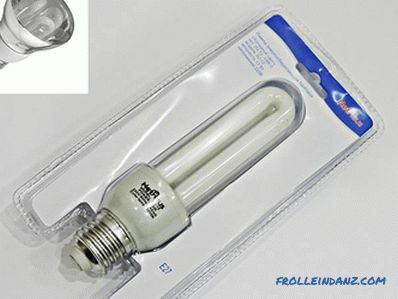 More durable turned 12 volt light bulbs that are connected through a stabilizer. Nevertheless, the lighting turned out to be uneconomical, and the lamps were heated decently, because of which there were some restrictions when choosing the place for their installation. When choosing a luminaire with halogen lamps, it is better to give preference to 12 volt, since they will last longer. For a short period of time, the cost of the transformer will pay off. The use of housekeepers contributed to the fact that the lamps were no longer hot, and when using high-power LEDs, not only significantly reduced power consumption, but also reduced the height of the lamp. 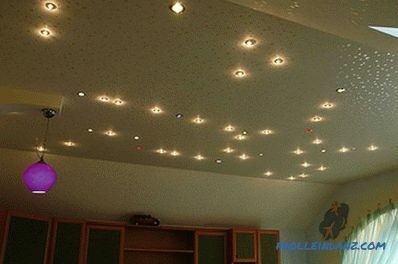 Using LED lights, the ceiling can be lowered quite a bit. Diode lamps are more economical and durable, but they have one feature - the circuit is assembled sequentially (on the principle of Christmas garland), and stands one light element to burn out as soon as the whole lamp stops shining. However, this happens infrequently, so this type of lighting is more economical in all respects, and for apartment owners with low ceilings, it is like a godsend. What to choose in order to make the room bright and cozy? So, we have come very close to choosing the type and form of lighting fixtures. No single spotlight is designed to illuminate the entire room, since it emits a highly focused beam of light. Because even a large number of spotlights not able to fully illuminate the room, then you need to take care of installing a chandelier, etc. Spotlights are better used to illuminate some part of the room or furniture, and as a main source of lighting it is preferable to install a chandelier (or something else, your choice). Someone prefers that everything in the room is in harmony with each other, another prefers bright contrasts - this is a matter of taste and is determined by the chosen style of the room. The same principle applies to lighting fixtures, but square luminaires in combination with a round chandelier can create visual discomfort. We are not trying to impose any rules, claiming that it is so right, but we want to draw your attention to this feature of the design of the room. 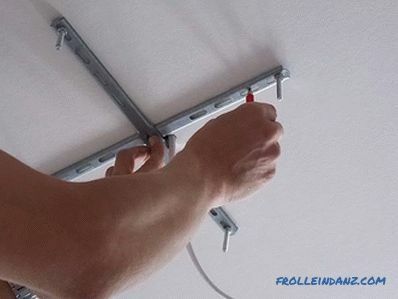 Mounting fasteners for a light chandelier to a plasterboard ceiling if it is heavy, at the stage of mounting the framework for drywall you need to take care of the method of its fastening. 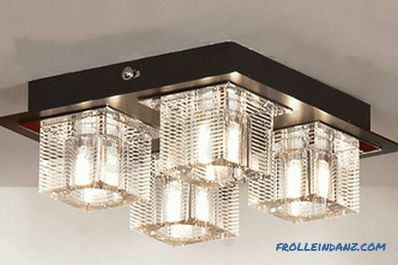 Light chandelier can be mounted on drywall in the same way as overhead lights. In rooms with a high level of humidity, waterproof lamps should be installed. 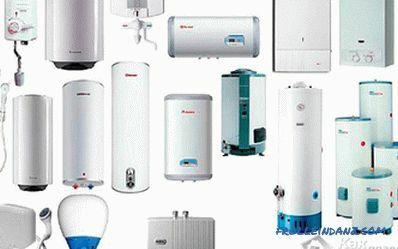 The degree of protection varies and is usually indicated on the product through special markings. For example, for a luminaire with an IP 44 indicator, only accidental ingress of water is permissible. The IP 55 indicator indicates that even a directed jet of water will not cause any harm to the product, and it will not penetrate into it. We hope that you have received comprehensive information, and now you can easily select and install a lamp.